Don't let the holiday season pass you by without sending a toast to everyone you care about. 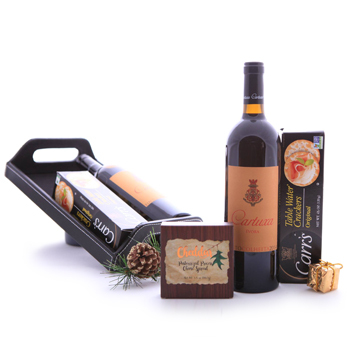 Our gift experts have made it easy with this classic treat that includes a bottle of robust Dry Red Wine (750 ml), complemented with decadent gourmet Cheese Spread (100 gr.) and Water Crackers (120 gr.). It's the perfect holiday repast for anyone of refinement on your holiday list. Send A Bite with Red Wine this Christmas. Attention: Gift packaging varies based on delivery location and the season. Your gift may be delivered in a a gift box, tray, or a traditional basket. "I found Gift Baskets Overseas doing an online search and I can tell you - they are fantastic. Our son is overseas in the Czech Republic and I wanted to surprise him for his birthday - 21st - and everything that Gift Baskets said they would do - they did. They went above and beyond the call of duty to ensure that this gift was received by my son. It was so important to us and they realized it. I would recommend Gift Baskets overseas for anyone who wants exceptional gifts with exceptional service. And in today's world it is very hard to find businesses along with intelligent customer service that take responsibility and truly care! Thank you so much!!! "